Model No. RE003: Body Size 14.2 cm. 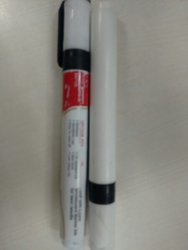 We are engaged in offering White Board Marker to our clients. The ink of these markers are alcohol based and fitted with polyester fiber bullet tip. All these markers are widely used on white board and other surfaces such as ceramic, glass or glazed surfaces.